My first real camera was an Olympus OM/10 which I used for many years, initially with Kodachrome 64 slide film then with some generic colour film. At that time I enjoyed taking photographs but did not really take it seriously nor did I really understand what I was doing. Shortly after arriving in Japan I bought my first digital camera. 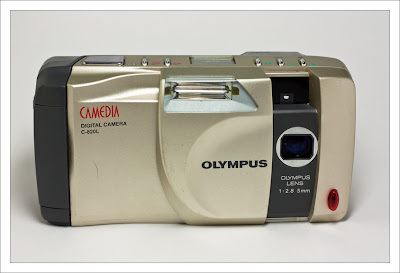 This was also an Olympus, a C-820L 0.81 Megapixel camera (shown in the photo) which used 2Mbyte SmartMedia memory cards. At the time it seemed amazing, but with no zoom and a ridiculously short battery life it was geek toy not a serious camera. When my children were born we got a Canon Kiss SLR for family photographs. As with the OM/10, I still did not take photography too seriously. Film was still relatively expensive and the turnaround time for processing meant it was a long time before I could see the results by which time I would have forgotten the conditions under which the shot was taken. Once digital cameras had improved I went back to a digital point-and-shoot. The attraction of seeing the pictures immediately was too strong. The Canon SLR then sat in a drawer. While shopping for a new point and shoot to replace my wife’s broken one I realized that the price of D-SLRs had dropped to the same as a good point-and-shoot and less than I had paid for the Olympus C-820L 10 years earlier. Also, if I got a Canon I could use the 90-300mm lens that had come with the film SLR. So I bought a Canon Kiss X2 (450D). Having bought the DSLR, I thought that I better learn how to use it. This was just before a trip back to England for a summer holiday, so I bought a book on using the 450D (it was easier to read than the Japanese manual that had come with the camera) and downloaded some photography podcasts that I listened to on the plane. Several trips to bookshops in England yielded more books on digital photography; it seemed that I am now hooked. FYI, for consumer goods marketed to English speaking countries like your camera, you can often get an English manual from the company. I got English manuals for my Japan-bought Nikon cameras directly from Nikon for 600 yen. And of course, many of these things are available for free via PDF (for example, here is your camera's manual). Thanks for the comment. I had already got the PDF version for the camera and for all the software packages that come with it. The version that I downloaded has a COPY watermark across it when printing so I haven't bothered to actually print it out. I had not thought about trying to get a printed manual from Canon. I will look into that, thanks for the suggestion.